Natalie B Photography: Holiday Mini Session ! I have been so extremely busy this senior season that I have been a little late on getting my Holiday stuff ready! After a few nice clients have nagged me a bit about it I am finally getting my stuff in order! I only have a very limited number of sessions available for the remainder of 2007! I am going to schedule Mini Holiday Sessions on October 20th. I will only be taking 5-10 families so please call me ASAP to book. Mini Sessions will be set up so that their main objective is getting an image for your Holiday Card. The session will last around 30 minutes and 5-8 images will be shown. The price for the session will be $150.00 but it will include either 50 5×7 Holiday cards, one 5x7 print or one digital image. 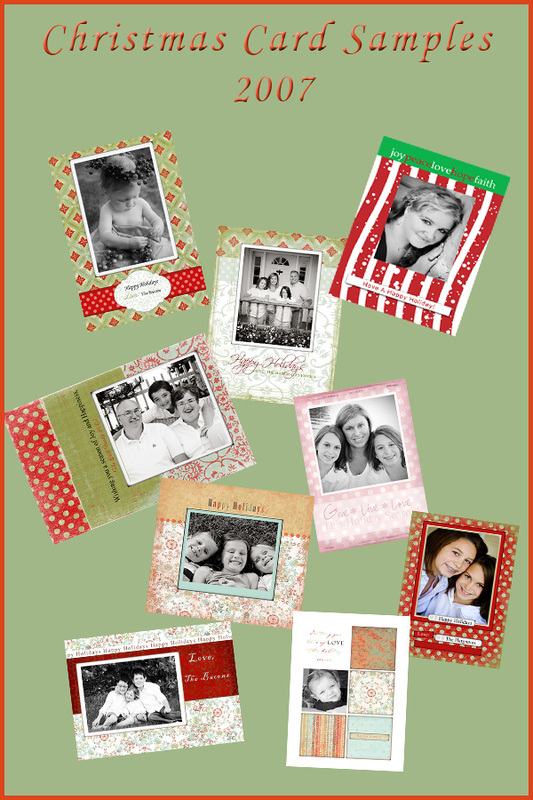 This will give you the option of either choosing one of my templates or making your own Holiday Cards. Additional prints may be purchased with a 20% off discount. Email me if you are interested in these sessions. I will require that the day be filled in order to offer them. I will aslo send you the link to check out the gallery of Card choices! Ordering will be simple with the my online shopping cart. All templates will be displayed there and you will be able to choose your card when you order. All cards are 5×7 in size and can be made as flat photo cards. They are sold in packs of 25 and include envelopes. In review the mini session schedule is as follows. *A partial payment of 75.00 is required in advance to hold session time and the remaining 75.00 is due at the time of the session. *All orders must be placed within 2 weeks from the date of their session.